UK – RVE, the renowned French lantern dimmer manufacturer with over 42 years of designing and manufacturing dimmers in France, has added to that with an extremely high quality range of professional theatre and film/TV LED lanterns which will be exhibited at this year’s ABTT Theatre Show in London on the stand of Cartey & Co.Ltd. On Stand No. 1 at the main entrance, right opposite the registration area, visitors will be able to see not only the new RVE Twin LED F and TwinLED Profile luminaires but also the newly launched (in the UK and Ireland) Cube series of single channel dimmers designed for film/TV location lighting and for theatre rig situations where powerful and reliable high quality single channel dimmers are required. 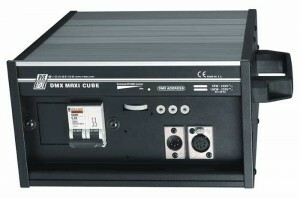 The Cube range of dimmers rate from 3.8kW to 5kW to 10kW and are available with CEE 16a and CEE 32a sockets. The ‘Cube’ series are already in use throughout Europe and have been developed by RVE, whose reputation and legacy in manufacturing high-powered dimming is second to none. Now finding great interest from rental companies in the UK and Ireland, RVE are taking the opportunity to showcase them at the ABTT Theatre Show. The TWIN LED F has been selected by a top theatrical venue in the UK and has now been specified on major projects requiring a Western European designed and manufactured, high quality, professional LED lantern. The whole optical design is French and the LED engine ‘crate’ is factory replaceable, ensuring a long service life. Every LED lantern, together with ‘classic’ Tungsten Halogen lanterns, is manufactured and assembled by RVE just near Paris. RVE has a sales office in Paris and its main R&D and production centre is just outside the capital and not far from a certain large American theme park that now has hundreds of RVE dimming channels installed and supported. Clive Cartey of Cartey & Co Ltd will be on stand No.1 together with French colleagues and has also announced that Cartey & Co Ltd is now the RVE manufacturer’s agent for Italy, running from the company office in Abruzzo.